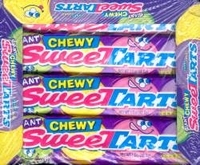 Giant chewy sweet tarts by Wonka. A great tasting treat with a mixture of tangy, tart and sweet candy all in one. 4 Sweet tarts per package. These are an old time favorite candy, you used to be able to find at any corner candy store. Some other favorites are bottle caps, lemon head, lollies, smarties and jaw busters. Get 36 packages per box, with each pack containing 4 giant chewy sweet tarts. That a total of 144 pieces of sweet and tart candies.